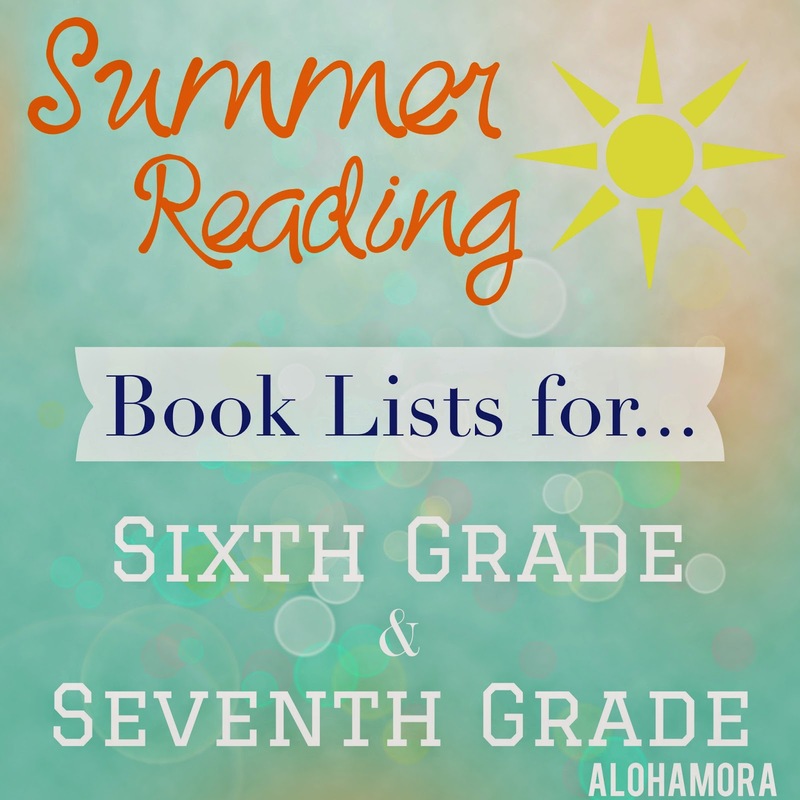 For all of those soon to be middle school or junior high students aka for all of those kids going into 6th and 7th grade the Summer Reading Book Lists below are for you. This list is also for all of those parents with a kid going into 6th or 7th grade. Trust me, you both need this list. Plus, you parents will enjoy these books just as much. Reading is fun, rewarding, entertaining, and critical. If you are a "reader" you know this all ready. Summer Reading is all of those things and more b/c it helps keep kids where they are at "educationally" over the summer and prevents them from "losing" too much. If you want to help your kid the most this summer, you don't have to spend a thousand dollars for expensive camps. All you need to do is get them a library card, go to the library and get great books (or reserve them online), and let them read (or read with them). Plus, the library has great summer reading programs that you can sign up for and earn great prizes including free books. Kids need to keep reading in the summer. Parents need to help their kids by encouraging them to read and even reading with them. If you have a girl or boy who does not like to read, aka a reluctant reader, let them choose a book from the lists below, and read the book along with or to them. They are all great books that you both will enjoy, and reading a book with and to your child can help light the fire to reading. A reluctant reader is just someone that hasn't figured out how amazing reading is. Trust me, I was a reluctant reader all the way through my undergrad. A great book or series can get that love for reading started, but you need several great books to really get the blaze of reading going. A hilarious book that boys and girls will both love. This book/memoir is great for R\reluctant readers b/c they can easily relate, as well as be shocked by some of the stories, that Scieszka shares. Jon Scieszka is a great author of picture books (The True Story of the 3 Little Pigs) as well as chapter books (Time Warp Trio) that kids love. This is a peek into his hilarious and crazy upbringing. You and your child will both be laughing. Stargirl is one of my all time favorite books; I read this to every class I taught at the beginning of the year. It's great for teaching that it's okay to be an individual. Girls will mostly read this b/c of the title, but if a teacher or parent reads this to their boys they will love the story as well. Another great book by Spinelli that boys will read on their own as compared to Stargirl. Though, girls will enjoy this book as well. A great, Newbery Medal Winner book teachers, parents, and students will all appreciate and enjoy the well writing and fabulous story. This book is another good reluctant reader book. There are 13 books total in this fun clean series about some orphaned kids/siblings that go through some truly unfortunate events b/c of a not so nice uncle. This book is great for vocabulary development; Snicket often uses large words and always defines them. The Bad Beginning is the first in the series. Another Newbery Winner and a book that both boys and girls can enjoy. This mystery story is about a brother and sister that run away and live at the museum. It's incredibly entertaining, fascinating, and you can really learn a thing or two from it. Love this book! A fabulous adventure series that boys love and girls do too. This classic book may be one you have already read, but it's worth another read. Let me just say this book is fabulous, and the Newbery Honor Winner medal on the front should tell you that as well. A great historical fiction that everyone should read at least once. This historical fiction, which a book about WWII is sure to attract boys, is absolutely fabulous. The reader not only learns a ton about code talkers, but the storyline is absolutely fabulous. Is the first book in the Shadow Children Series, a fabulous series that both boys and girls love. Set in a future/dystopian like society where a family is only allowed to have 2 children. This book and series is action filled with fabulous writing. A great classroom read aloud parent/child read aloud. The first in a dystopian trilogy, that has been made into a movie and therefore very popular. It can be quite graphic, violence wise, and therefore some parents choose to wait to let their kids read it. Press here for my review/thoughts. A classic and to some considered the first dystopian book. The Giver is well written, clean, and all around a great discussion book. Adults and kids enjoy this book, and it is a great audio book for any summer roadtrips. The movie is coming out at the end of the summer so it would be a fun book to read before. Press here for my review. Another great book by a great author. This book set in the late 1700s in Philadephia is a book that will fascinate you and keep you talking. It'll also make you weary of mosquitos. A great book to read with others and discuss. Is the first book in this action series. The ending is surprising and quite the cliff hanger, so have book two, The Scorch Trials, nearby. This action book is also being made into a movie this year, but the book is always better so read it first. Press here for my review. This Newbery Winner is absolutely fabulous! The writing and storyline is captivating. It may take a second to really get into the story, and it may not be a story a 7th grader would gravitate to, but it is fabulous and highly recommended. For my review, press here. This book is the first of the Book of Bayern Series, a fantasy series that is completely clean and completely fabulous. This series is geared towards girls, and I highly recommend it. For my review/thoughts press here. A great book and a Newbery Medal Winner. This book is well written, captivating, a realistic mystery with a touch of fantasy. The main character, Miranda, has a interesting life in NYC, but since she is a girl boys will usually be turned away from the book. However, it's not a girly book b/c there is plenty of action, suspense, and intrigue. As always, holler if you need/would like a more specific book list for your child. Though, to be honest all of these books are fabulous and you could easily make this list your own Summer Reading List.